(Bloomberg) -- Russian billionaires and companies are exploiting a lull in international sanctions to cash in on the appeal of the country’s equities. The window of opportunity opened as the U.S. lifted sanctions on United Co. Rusal at the end of January and amid the relative calm that’s settled since Washington targeted Oleg Deripaska and other tycoons 12 months ago. 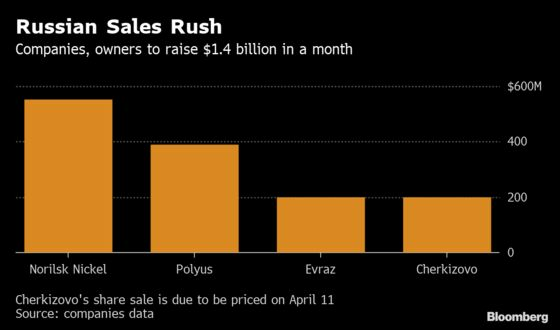 Now Russian companies and their owners could raise about $1.4 billion in March and April, according to Bloomberg data. "The window for share offerings opened. The owners and companies are trying to take advantage of it," said Kirill Chuyko, chief strategist at BCS Global Markets. "Such windows became rare and short for Russian assets and it is not clear when there will be the next one." Other billionaires may follow the example of tycoons who sold shares in Polyus PJSC, Evraz Plc and MMC Norilsk Nickel PJSC, said Sergey Donskoy, an analyst at Societe Generale SA. All those offerings were oversubscribed amid strong foreign investor demand and now sales look set to widen as Russian agricultural companies test the market. Cherkizovo Group PJSC, which delisted from the London Stock Exchange at the end of 2017, is selling shares, while Ros Agro Plc has also approved an option to sell a stake of as much as 23.8 percent. “There is a significant demand for high-quality Russian assets," Dmitry Bolyasnikov, co-head of equity capital markets at VTB Capital, said last month after the Nornickel sale. Russia also sold its first eurobond in years in March, with companies from closely held EuroChem Group AG to state-controlled Alrosa PJSC and Gazprom PJSC selling new international debt. Still, the situation remains volatile as the U.S. prepares new penalties for the 2018 nerve-agent attack on a former Russian spy in the U.K. Separately, a bipartisan group of senators reintroduced Wednesday the so-called Deter Act originally proposed in a previous congressional session. That might sour the outlook. "If there are no new significant sanctions, we might see IPOs later this year," Chuyko said. "Otherwise, a new window may not open soon."